Business and Commercial Air Conditioning Sales in Brevard County, Florida - Serving Melbourne, Titusville, Palm Bay and surrounding areas. We may be able to help your business save money on high Florida air conditioning expenses with a new high efficiency air conditioner system. If your business has an old outdated system you are wasting valuable electricity. A new energy efficient system can pay for itself over time. We promise that if you have us out to give your business an estimate, that we will give you my full attention, attempt to answer all your questions, show you all the available options and try to match you with the best system. We sell Trane, Maytag, Amana or Carrier, and are serving Melbourne, Titusville, Palm Bay and the surrounding areas for your commercial air conditioning needs. Space cooling accounts for roughly 15% of electricity used in commercial buildings — second only to lighting. ENERGY STAR qualified light commercial HVAC equipment is designed to reduce energy waste and save money on your utility bills. 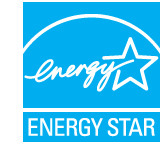 Earning the ENERGY STAR means products meet strict energy efficiency guidelines set by the US Environmental Protection Agency and the Department of Energy. 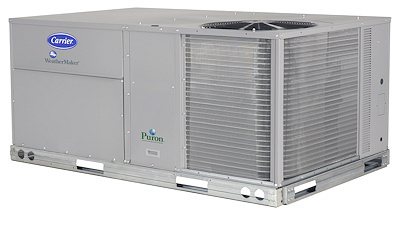 ENERGY STAR qualified light commercial HVAC equipment uses 7–10% less energy than standard equipment. These products can save your business approximately $3–4 per square foot over the life of the equipment. For example, a 12,000 square foot building using an ENERGY STAR qualified HVAC product, could save $36,000 to $48,000. Remember, saving energy prevents pollution. By choosing ENERGY STAR and taking steps to optimize the performance of your heating and cooling equipment, you are helping to prevent global warming and promoting cleaner air while enhancing the comfort of your home. You may be interested to know that, according to the Consortium of Energy Efficiency, at least 25% of all rooftop HVAC units are oversized, resulting in increased energy costs and equipment wear. Properly sized equipment dramatically cuts energy costs, increases the life of the equipment, and reduces pollution. If you are concerned about your outside ac condenser holding up against Florida’s harsh environment then you should consider a coil and cabinet treatment. For people who live near the beach this is a must have protection with the ocean salt in the air. Between the sun and salt in our air your outside condenser takes a beating all year long. There is a product that can greatly slow the deterioration process down and it is called THERMOGUARD. This is a unique metallic impregnated polyurethane base coating that when applied properly extends the life of your whole ac condensing unit. This product is used in both residential and commercial applications. It not only extends the life of the condensing coil but also products the paint on the cabinet. 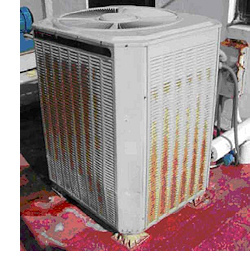 The product should be applied at the warehouse before the condenser is exposed to the environment. THERMOGUARD has representatives that come to your contractors building and applies the treatment themselves. Make sure you get documentation this product was applied most contractors use a cheap spray coat the lasts a couple months. THERMOGUARD chose the use of polyurethane to cope with the expansion and contraction of the coil, reflect UV rays/ heat, and provide the best protection to coastal and/ or industrial environments. This product has been used in Europe for the past 15 years and the past 5 years here in the United States of America. THERMOGUARD will maximize the life of the unit, as well as, keeping the energy usage stable throughout the life of the equipment, by not allowing corrosion. *Marine by ASTM B-117: This salt spray test shows no defects after 10,000 hours- reflecting ten years extension of lifetime in real life at the seaside. *Urban by ASTM B-207: City life causes acid rain, THERMOGUARD shows no defects after 3,000 hours reflecting nine years of exposure to an urban climate. *Industrial by DIN 50018 or Kesternich test: Hundred and twenty cycles or ten years of heavy polluted sulphuric air have been a proven success for THERMOGUARD. *Tropical area by OZONE exposure-temperature changes humidity: THERMOGUARD was exposed in a humid cabinet to OZONE and extreme temperature fluctuations. By succeeding THERMOGUARD proves to be able to cope with tropical weather conditions. *DESERT area by TABER ABRASER test: The TABER ABRASER test concludes about exposure to erosive conditions like sandstorms. THERMOGUARD passed this test as extremely resistant to mechanical impacts. We offer commecial and business A/C in Central Florida in the following and surrounding areas.